As one of those Park City residents who has traditionally ventured to the Salt Lake Valley only for the airport, and on occasion, Costco, lately, I can hardly recognize myself. During the past few months, I have begun to discover the maturing Salt Lake restaurant scene and have even driven down the canyon for the sole purpose of dining. With a few exceptions, Park City’s culinary offerings have been somewhat stagnant by comparison, and after 14 years of frequenting the same establishments, I am feeling the need to broaden my gastronomic horizons. Two realms Park City hasn’t really tackled—gastropubs and wine bars—are becoming more prevalent in Salt Lake City, providing added incentive to make the dining commute to sample more cutting-edge cuisine. It’s also refreshing to enjoy a meal where no one knows your name. While the summer season is typically the time for Wasatch Front residents to beat the heat by driving to Park City, there are a few hot spots that are worth making the reverse commute for. 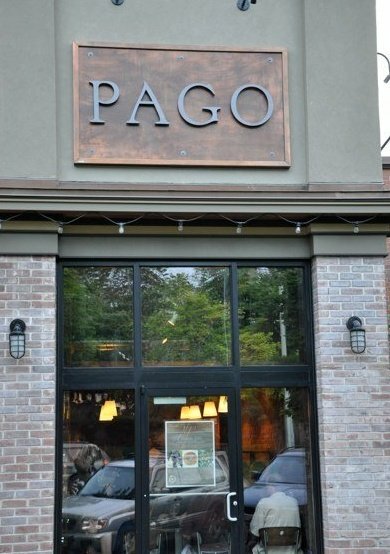 They offer progressive, contemporary cuisine coupled with engaging atmospheres and prices that will beat Park City’s two-for-one entree deals. I am also impressed by the high level of professionalism of the servers and bartenders at my new favorite eateries. The money you’ll spend on gas will be offset by the fact that you can’t consume as much alcohol if making the drive back up Parley’s. Then again, there’s always Uber. 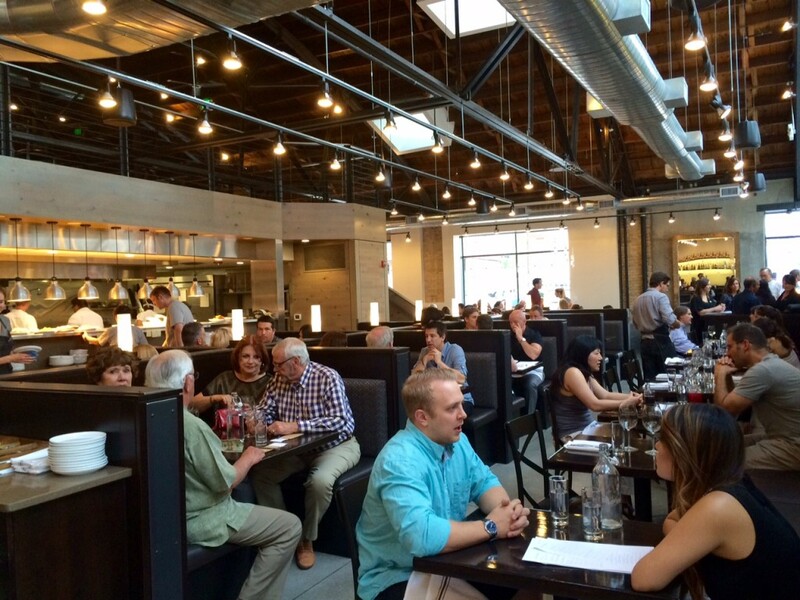 Located in a historic, brick building that housed the only Ford dealership West of the Mississippi from 1900 to 1940, Current Fish & Oyster serves contemporary seafood in a stylish, airy setting. Mikel Trapp (Cafe Trio, Fresco, Luna Blanca) and Joel LaSalle (Faustina, Oasis Cafe, Caffe Niche, Kyoto) opened the restaurant in late February, catering to seafood lovers “trapped” in a landlocked state. 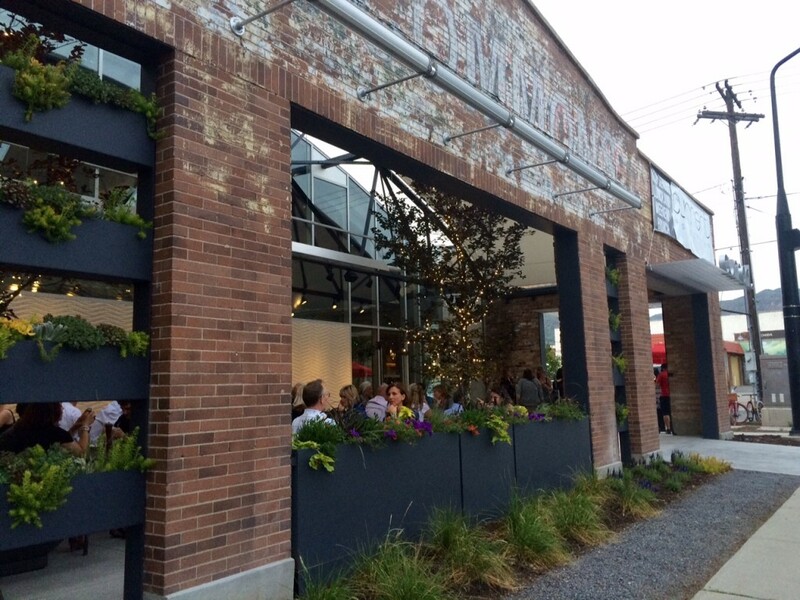 The completely renovated building features an expansive dining room and beautiful patio accented by the brick facade. Unfortunately, the bar has been afflicted by the curse of the Zion curtain, which makes sitting at the bar and facing a wall somewhat unpleasant despite a robust selection of cocktails, wine and beer. 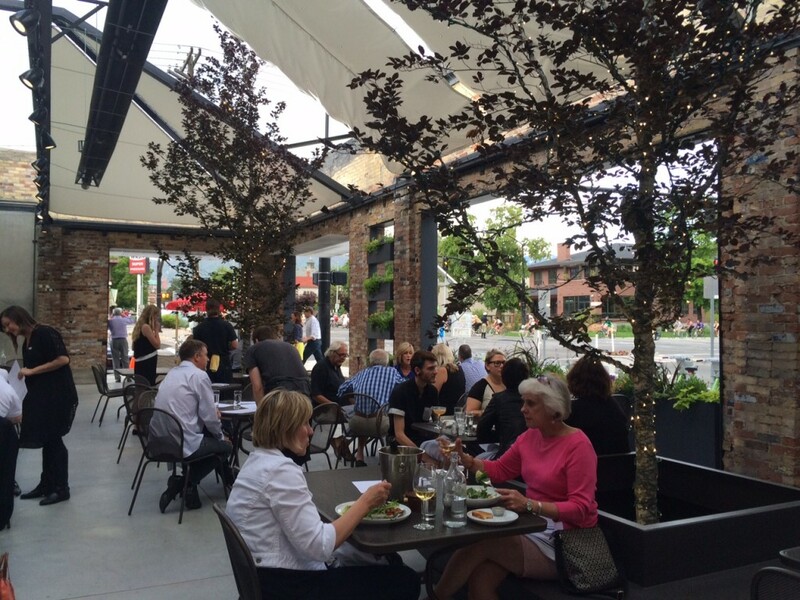 But it’s summertime, so request a table on the patio to see and be seen by the cosmopolitan crowd. The menu features a selection of cold and hot plates that are ideal for sharing, in addition to salads and entrees. While seafood dominates, there are plentiful options for landlubbers like oven-roasted chicken, prime New York strip steak and a burger. The grilled calamari appetizer, served in a jalapeño, scallion and lemon aioli, was probably the best I’ve ever enjoyed. And I am someone who orders grilled calamari whenever it’s available. The caramelized, organic salmon entree is served in a soy-sake marinade with green beans over a boniato purée, which is a type of sweet potato. The sweetness of this dish made it double as dessert. Other items worth going back to try are Alaskan king crab lettuce wraps and gulf prawns & white cheddar grits. The oyster selection changes daily. And ideal for summer imbibing, there is a lovely Rosé selection, not often seen on Utah wine lists. An appetizer, entree and two glasses of wine seemed like a bargain for $56, and I couldn’t stop raving about my meal the next day to anyone who would listen. The first, true wine bar I have managed to come across since moving to Utah nearly 14 years ago, BTG Wine Bar (BTG, as in By the Glass) rivals similar establishments in bigger cities. The casually chic decor is reminiscent of neighborhood bars in SoHo, and the staff is friendly and immensely knowledgeable about their offerings. Small plates are actually priced accordingly, but the portions tend to be ample. The eggplant meatballs ($4.95) are a favorite as is the spinach salad with wild mushrooms, mozzarella, Roma tomatoes and pine nuts ($6.95). Craving something sinful? Try the mac & cheese with penne pasta, wild mushrooms, roasted garlic, fresh herbs and three cheeses with truffle oil ($12.95). There is also an artisan cheese plate ($12.95) to pair with your wine, as well as antipasti ($14.95) and a selection of bruchetta ($3.95-$5.95, depending on the toppings). As one would expect from a wine bar, BTG has a vast, diverse offering of red, white and sparkling wines, available as 2 oz or 5 oz pours or by the bottle. Many countries and domestic regions are represented, and flights are offered if you can’t decide on just one. Here’s a gastropub in an industrial, historic setting for those who know their spirits and prefer them complemented by high-end, creative pub fare by visionary Chef Matt Crandall. 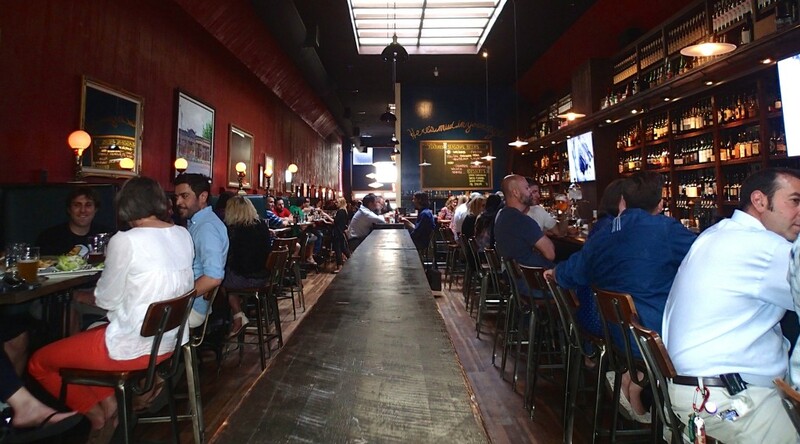 Whiskey Street is the ideal downtown bar to gather after work and rub elbows with an interesting mix of business executives and tattooed hipsters. The long bar and communal tables make for a high-energy, casual environment to strike up a conversation with someone new. It’s easy to forget you are in Utah with the overwhelming selection of spirits, microbrews and wines on tap. They have a vast mule cocktail menu, as well as whiskey flights. Basically, it is a paradise for whiskey, rye, scotch and bourbon aficionados, which makes sense given Brigham Young himself once declared this stretch of downtown to be Whiskey Street. The menu beckons you to explore innovative variations on comfort classics like the short rib grilled cheese, shrimp B.L.T. and braised pork belly corn dogs. 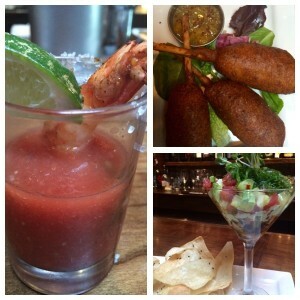 The grilled shrimp gazpacho shooter will help you beat the valley heat. A clever, martini glass presentation, the ahi tartini is light, refreshing and perfect for sharing. Entrees include rosemary lamb chops, Kentucky bourbon salmon and stuffed free range chicken. Add to this a wide variety of salads, and there is truly something for every palate. Don’t feel like heading all the way downtown and paying for parking? 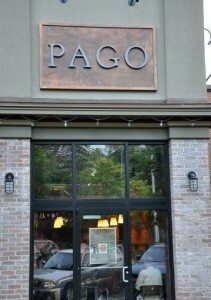 Visit the charming 9th and 9th neighborhood and enjoy Pago’s authentic, farm-to-table concept. The intimate restaurant regularly changes up its seasonal, new American cuisine, which keeps its foodie guests intrigued. My date and I enjoyed sharing several plates, which gave us an excellent sampling of the menu. Recommended: Manilla clams ($18) served inventively in a sparkling wine and vermouth broth (you will want extra bread for dipping), BBQ beets ($9) with smoked honey, toasted grains, yogurt, shaved root slaw and Wagyu beef sashimi ($11). Halibut is in season, so be sure to try this satisfying and flavorful entree with bay leaf broth, fava & white bean ragu, turnips, beech mushroom, citrus and capers ($33). The Morgan Valley braised lamb and gnocchi ($23) is a heavier dish with mint and pistachio pesto and housemade ricotta. Pago has an enticing dessert selection, but you can also opt to walk over to Dolcetti Gelato for some pretty authentic, Italian-style ice cream. More plates than we could count, dessert and a couple of glasses of wine added up to just $130. in response to your comment about “The 2 realms Park City had not yet tackled. Gastro Pubs & Wine Bars” I guess it’s time you (re)-Visit Boneyard Saloon & Wine Dive IN PARK CITY !! 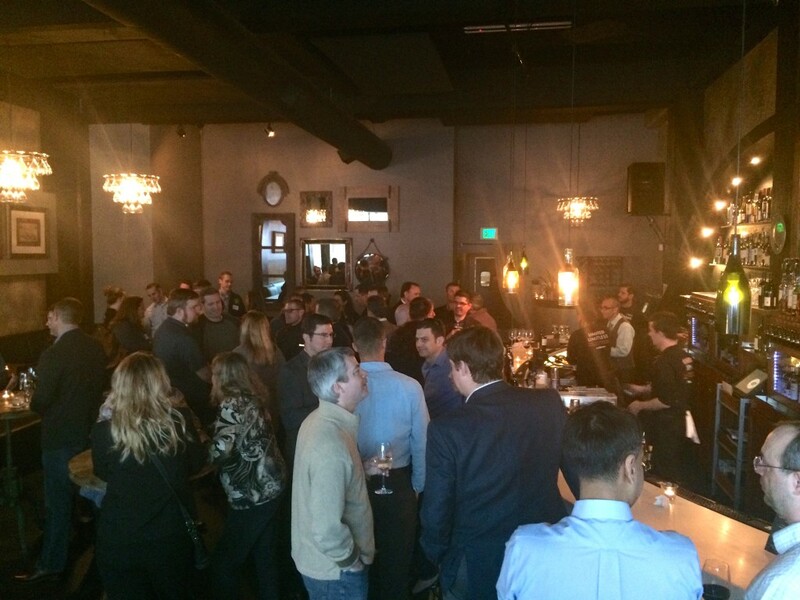 A Most Unique atmosphere found anywhere (including SLC) we offer a Gastro pub atmosphphere on one side and a Wine Bar on the other.. Each with menu items designed appropriately for the venues by Jesse Shetler and Fine Dining chef Jerry Garcia. It’s rare to find both a Wood Fired Grill and a Wood Fired Oven together offering everything to please even the most hedonistic of foodies such as yourself. Artisan Pizzas, Gastronome Burgers and Sandwiches with Pomme Frites, Tempura Batterec Wings, Decadent Salads and Veggie platters, Seafood dishes, Cheese & Charcuterie Boards, and a Small Plate Menu that stacks up to any (including SLC) this of course is in addition to the 16 Wines on Tap (found in the Wine Bar) the 85 plus Craft Beers (found in the Saloon) and the array of Specialty Cocktails throughout the establishment. Oh, I almost forgot to mention that it is by far, the premier spot to watch any Major Sporting event and has one of (if not) the Largest Roof Top Patios boasting Mountain Views Not offered by any other Gastro pub & Wine Bar in the State (including SLC) … One more thing, this Unique establishment offering both Gastro Pub & Wine Bar atmospheres is all under one business license and one Liquor License which means you can sit any where you like and order from either menu creating an experience unlike any other in the State of Utah, Including Salt Lake City… Plenty of Free Parking and 3 Bicycle racks in our private lot makes Boneyard Saloon & Wine Dive an easy choice without having to drive the 30 plus miles down the canyon. It just so happens that Wine Dive was slated for inclusion in the follow up article highlighting new places in Park City that Salt Lakers should visit when driving up the canyon to beat the heat this summer.